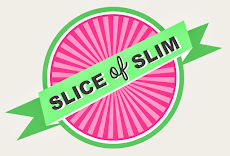 Slice Of Slim: Hot Off The Press NEWS! : Slice Of Slim is 3 ! To celebrate three years of blogging, I've created this number 3 from a selection of my current top favourite flavourings and ingredients! If you're going to eat healthy food it needs to be delicious, so make sure that both your store cupboard and fridge are stocked with some or all of these ingredients- you'll see them featured regularly in many of my recipes. At the end of 2011, I started to photograph the foods I was making on a daily basis and popping them on my personal Facebook page. After a few positive comments, I soon realised I had a great deal to say and was bursting with ideas. I had a tremendous need to share my recipes, tips and inspirations gathered along my personal weight loss journey. and now a YouTube channel! Of course, I love everything about the process of blogging - creating recipes, styling and photographing my dishes alongside writing descriptively about the processes and flavours....but the most important aspect for me is supporting and inspiring all of you on your own journeys - whether that is weight loss, maintaining or just wanting to eat more healthily. Thank you to all my supporters, friends and family who have been there every step of the way with me. I appreciate the fact that you constantly return to read my posts each day. It wouldn't exist without you. I'm still brimming with ideas, hopes and dreams for Slice-of-Slim, so lets see if 2015 is going to be another exciting year. Keeping the joy of food alive by reducing the fat and retaining the yumminess! Well done Janey and Happy 3rd Birthday! I've been following you now for 2 out of your 3 years, and I am constantly liking your posts to make later. Keep it up!